ISIS media center al Hayat released a video today of the Paris attacks. 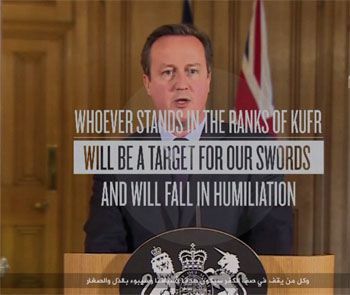 It has some photos that were in the most recent issue of Dabiq magazine, shows the attackers making statements (not together), has a lot of gruesome beheadings, highlights its encryption of messages, and ends with a threat to Great Britain. Update: Belgian and other intelligence officials say Abaaoud is dead. The French prosecutor says he's not among those arrested. 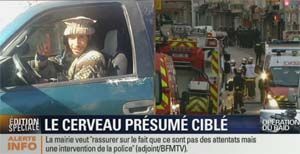 French police raided an apartmment in the St. Denis area where attack suspect Abdelhamid Abaaoud (aka Abdul Hamid Aba Oud,) and some others were believed to be holed up. Reports are that seven people were arrested (some nearby the apartment), and two or three people were killed. While Charlie Hebdo reported Abaaoud was arrested , the Daily Mail (best photos) and other media report that has not been confirmed. 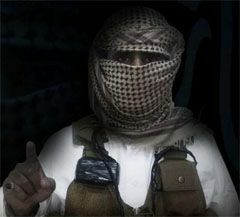 In November, 2014, just days after the mass beheadings of Syrian pilots by Jihadi John and 16 or 18 other fighters, in which Peter Kassig's severed head appears, French ISIS members released a video, What Are You Waiting For?" It reportedly served as one of the inspirations for Almedy Coulibaly's Charlie Hebdo attacks. You can watch a copy with English translations here. I wrote about it at length here. SITE described it here and the Daily Mail here. ISIS has released an official statement (English audio here) claiming responsibility for the Paris attacks and explaining why.